structure or involved fire zone. 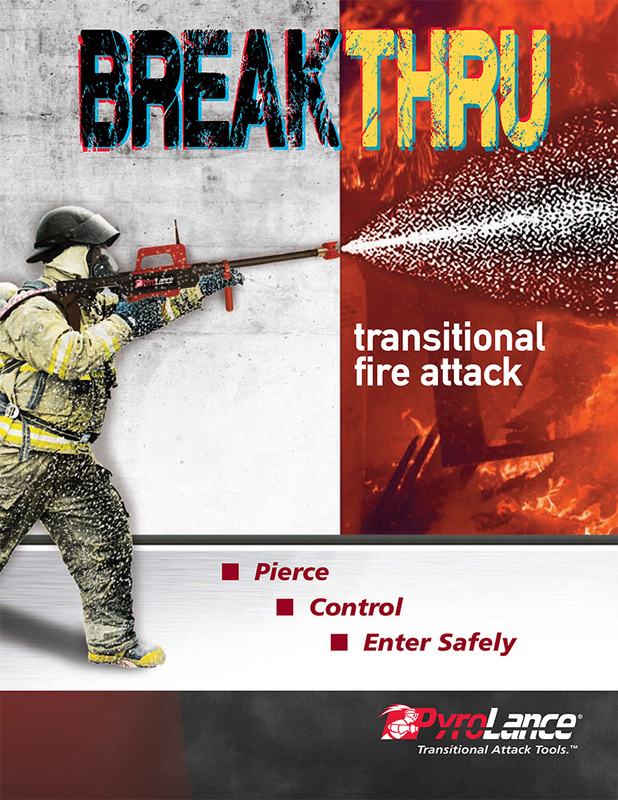 This new strategy of asserting control of the fire prior to entering is a key aspect of transitional fire attack and the overall emphasis toward increased fire fighter safety. While using the PyroLance, it is possible to be in an aggressive interior attack mode while maintaining a defensive exterior position. 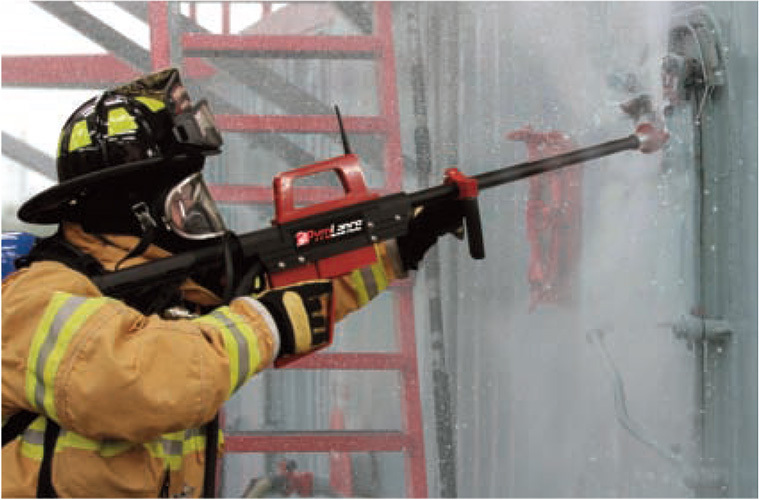 The PyroBlitz is a tough, lightweight, aggressive attack line with a superior stream reach that’s ideal for fighting structural fires. 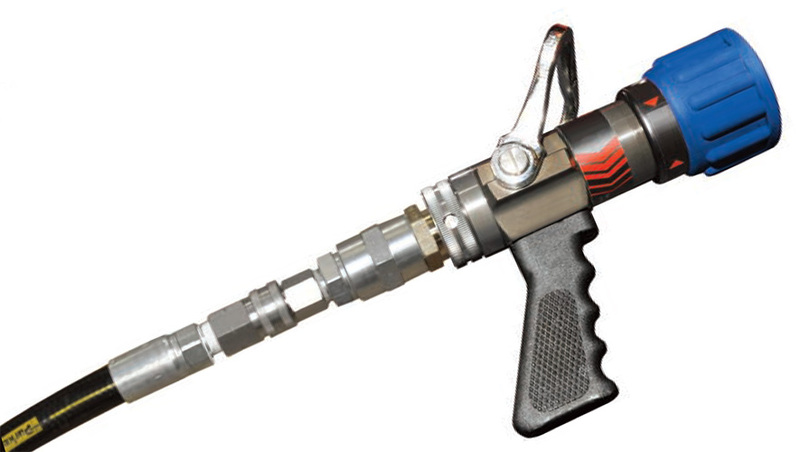 The PyroBlitz uses a non-piercing UHP combination nozzle that allows quick adjustments in stream patterns. The PyroBlitz can be ordered as a standalone unit or in combination with the PyroLance for a powerful one-two punch. Both systems are engineered to protect the safety of life inside a structure. interior fire conditions from a defensive exterior position with reduced risk to the fire fighter. 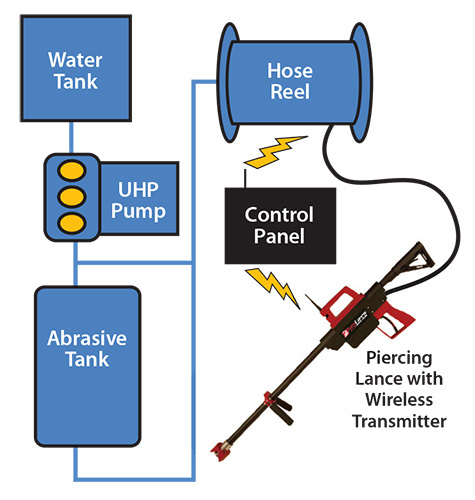 The PyroLance system consists of a high-pressure pump unit, water supply, abrasive supply, hose and hand-held lance. 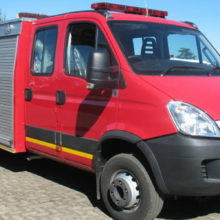 The PyroLance and the PyroBlitz can easily be integrated within any fire vehicle, trailer or skid. Gasoline (petrol), diesel or PTO hydraulic configurations available. fatigue and stress. UHP also provides a greater reach when compared to traditional handlines, enabling firefighters to attack fires from a safer distance. effectively wasted. By contrast, 90% of ultra-high pressure flow is effective in knocking down and containing fires.